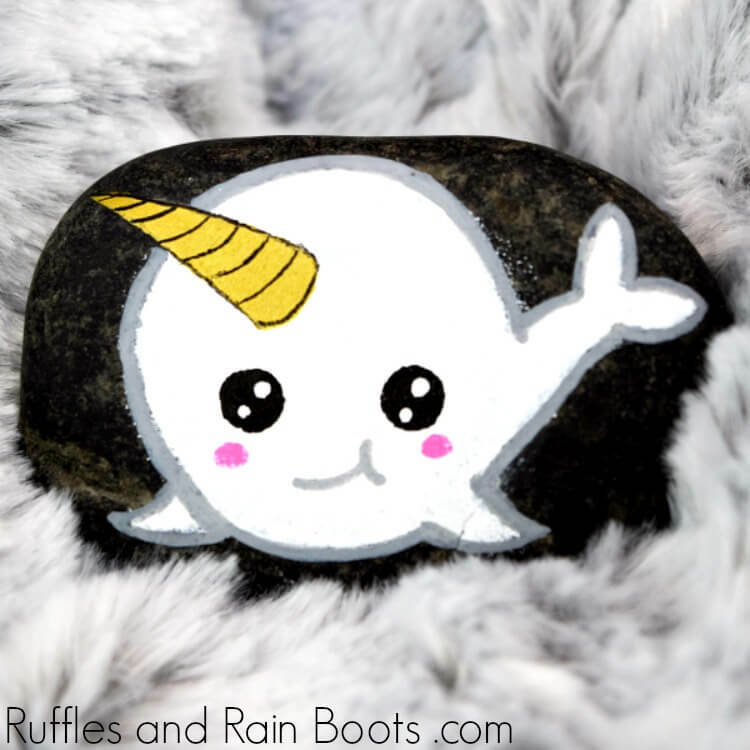 This Kawaii narwhal rock painting is sure to bring the smiles. It’s one of the easiest and most fun rock painting ideas we’ve made. Let’s get started! Here on Ruffles and Rain Boots, I love to share our rock painting ideas. We have so many, they had to be divided into categories (just check out that menu bar above for your favorite). Kawaii rock painting ideas are some of my favorites because they’re just so happy! 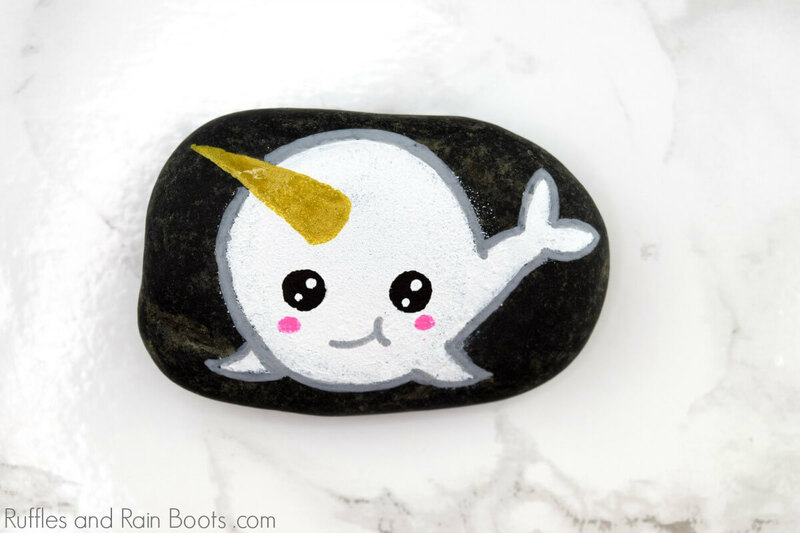 This adorable narwhal rock painting was done in less than 20-minutes and the kids just loved it. My 7-year-old was able to draw this, so it’s a great beginner rock painting idea, too. 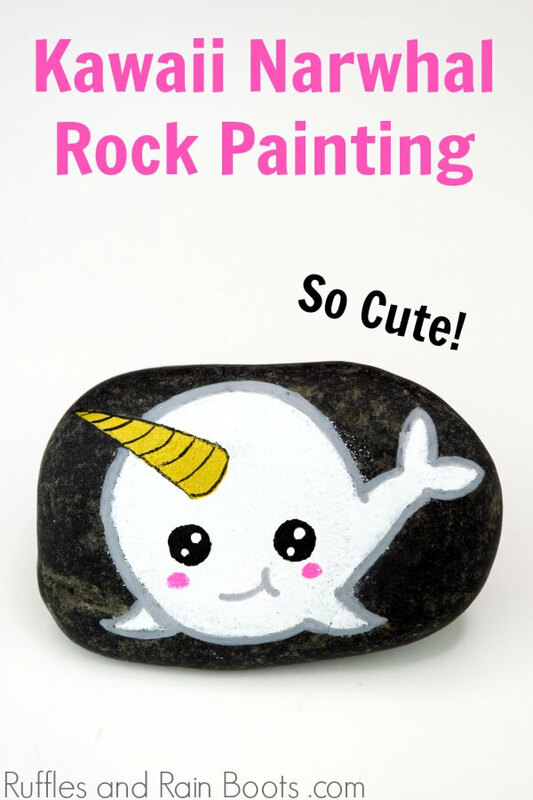 Learning how to paint a Kawaii narwhal rock painting is easy, friends. You start with a circle and go from there. You can follow my trick to add shadow to the bottom or keep it for your next rock painting idea. Before we get started, here are a few supplies I use when painting stones. You can see my list of recommended rock painting supplies on Amazon here (it’s where I get everything). Kawaii style rock paintings might be my favorite. Our popular Kawaii eyes tutorial is just one of the fun Kawaii-style rocks I’ve made. Here are a few tips to ensure your rocks will be loved by all Kawaii fans. 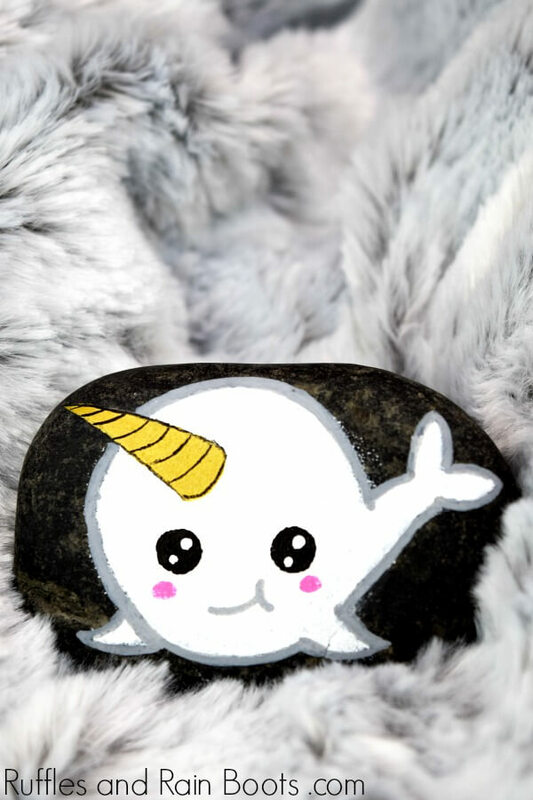 I’m a big fan of visual learning, so I put together a short video on how to paint a narwhal rock in the Kawaii style. 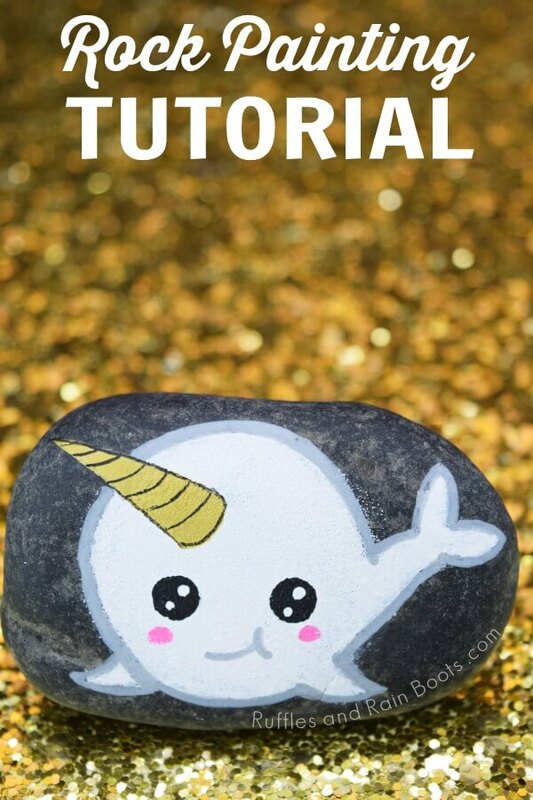 If you have a rock painting playlist on YouTube, my narwhal rock painting video tutorial is here. 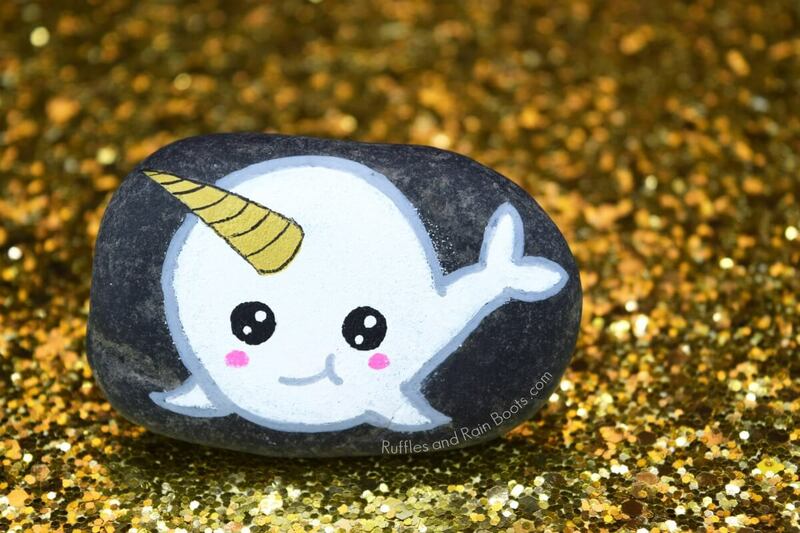 This Kawaii narwhal rock painting is sure to bring the smiles. It's one of the easiest and most fun rock painting ideas we've made. Let's get started! Use a pencil to trace a circle (I used the sponge brush which was 1 1/4 inches). Lightly sketch a horn, starting from the center of the head (top of the circle) and a tail (from the bottom right of the circle). See the video tutorial for how I easily do the tail. Finally, sketch the fins (one in front and one behind the narwhal). Lay out white paint and dip the round sponge brush in, coating it lightly. Transfer the paint to the rock, pressing and lifting lightly. Turn the sponge to coat any sparse areas. Before the body dries, use the white acrylic paint and a small, flat paintbrush to paint in the tip of the tail and the body. You can stippling or brush strokes. Draw the paintbrush flat down through the bottom of the circle to create a shadow. Use the sponge brush once or twice to blend it in, but you should still see a darker area. you can go over the tail portion again before painting in the fins. Let the white paint dry. Using the gold paint pen, fill in the tusk. The pink pen should be used to create small ovals for the cheeks. Finally, color in the blacks of the eyes and let dry. Outline the entire narwhal painting in gray paint pen and add a small smile or smirk. Use the white paint pen to add the reflections in the eyes (see the video for my tip on using a pencil). Before letting the rock dry, go over the gold tusk again. Before sealing, use a small pen (like a Micron or Mono) to outline the tusk and add the striations. Seal and you're done! For more rock painting ideas, visit Ruffles and Rain Boots here. Your shares are how this site grows and I am sincerely grateful. Please save this to your favorite rock painting board or share in your rock painting Facebook group.